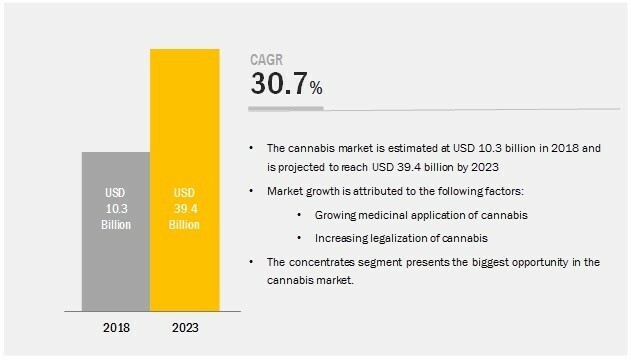 [149 Pages Report] The cannabis market is projected to grow from USD 10.3 billion in 2018 to USD 39.4 billion by 2023, at a Compound Annual Growth Rate (CAGR) of 30.7% during the forecast period. The study involved 4 major activities in estimating the current market size of cannabis. Exhaustive secondary research was done to collect information on the cannabis market. The next step was to validate these findings, assumptions, and sizing with industry experts across the value chain through primary research. Both the top-down and bottom-up approaches were employed to estimate the complete market size. Thereafter, market breakdown and data triangulation were used to estimate the market size of segments and sub-segments. In the secondary research process, various sources such as the Food and Drug Administration (FDA), United States Department of Agriculture (USDA), Federal Institute for Drugs and Medical Devices (BfArM), Bureau for Medicinal Cannabis (BMC), Health Canada, Federal Commission for the Protection against Sanitary Risks (COFEPRIS), and National Cannabis Industry Association (NCIA) have been referred to, to identify and collect information for this study. The secondary sources also included cannabis manufacturers’ annual reports, press releases, investor presentations of companies, white papers, certified publications, articles by recognized authors, gold & silver standard websites, regulatory bodies, trade directories, and paid databases. Secondary research was mainly used to obtain key information about the industry’s supply chain, the total pool of key players, market classification & segmentation according to industry trends to the bottom-most level, and geographical markets. It has also been used to obtain information about the key developments from a market-oriented perspective. The cannabis market comprises several stakeholders in the supply chain. These include suppliers, manufacturers, end-use product manufacturers, and service providers. Various primary sources from both the supply and demand sides of the cannabis market were interviewed to obtain qualitative and quantitative information. The primary interviewees from the demand side include key opinion leaders, key distributors, and retailers. The primary sources from the supply side include key opinion leaders, vice presidents, and CEOs of the key manufacturing companies in the cannabis industry; research institutions involved in R&D to introduce new products. The key players have been identified through extensive secondary research. The cannabis market size has been determined through primary and secondary research. All macroeconomic and microeconomic factors affecting the growth of the cannabis market have been considered while estimating the market size. After arriving at the overall market size from the estimation process explained above, the total market has been split into several segments and sub-segments. 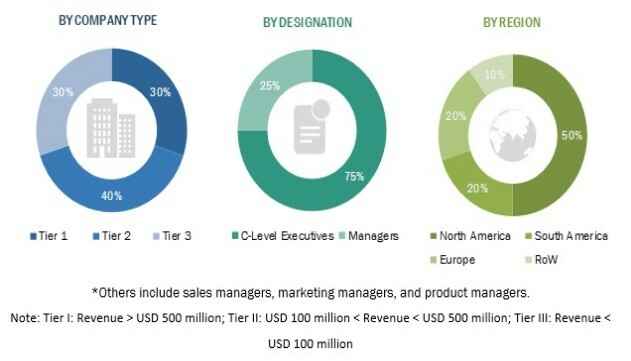 In order to complete the overall cannabis market and arrive at the exact statistics for all segments and sub-segments, the data triangulation and market breakdown procedures have been employed, wherever applicable. The data has been triangulated by studying various factors and trends from the demand and supply sides. Along with this, the cannabis market size was validated using both the top-down and bottom-up approaches. This research report categorizes the cannabis market based on type, livestock, and region. The cannabis market is projected to grow from USD 10.3 billion in 2018 to USD 39.4 billion by 2023, at a Compound Annual Growth Rate (CAGR) of 30.7% during the forecast period. The increasing legalization of cannabis and the adoption of cannabis for medicinal purposes are the key factors driving the growth of this market. By product type, the concentrates segment is projected to be the fastest-growing in the cannabis market during the forecast period. The concentrates segment is projected to grow at the highest CAGR between 2018 and 2023. This is due to their ease in usage, and their versatility in the method of delivery, such as dabbing, ingestible oils, and tinctures. Also, along with ingestion, concentrates can offer cleaner, smoother, and less odiferous hits than flowers. Additionally, concentrates are more potent in nature in comparison with flowers. While buds have a potency range of about 10% to 25%, concentrates have a potency rate of about 50% to 80%, with a few extracts also boasting of a potency of about 90%. By application, the recreational segment is projected to grow at the fastest rate during the forecast period. The recreational segment, by application, is projected to be the fastest-growing segment in the cannabis market. Despite recreational cannabis having an extremely low presence, its consumption and demand remain almost equivalent to that of medicinal cannabis, and hence, with further legalization, the demand for recreational cannabis could look at surpassing the demand for medical cannabis. Uruguay is the only country in South America that has legalized the use of recreational cannabis. The cannabis market is projected to remain concentrated in the US and Canada. The THC-dominant segment, by compound, is projected to be the fastest-growing segment in the cannabis market. The dominance of this segment is majorly attributed to the fact that THC is the psychoactive substance in cannabis products and is responsible for head high feeling. Even though high THC content is better known for its mind-altering euphoria, it has important medical benefits and is considered effective in relieving nausea, appetite loss, and insomnia. North America is projected to account for the largest market share during the forecast period. The North American cannabis market is estimated to account for the largest market share in 2018. The market in this region is primarily driven by growth in the US and Canadian markets. The cannabis market in this region is also driven by the increasing legalization of cannabis for both medical and recreational purposes all over North America and the increasing awareness among consumers regarding the health benefits of cannabis. The cannabis market is further fueled by the presence of major cannabis giants such as Canopy Growth Corporation, Aurora Cannabis Inc., and Medical Marijuana Inc. who are continuously investing and collaborating for the development of new products to fulfill the consumer demand. The cannabis market is dominated by major players such as Canopy Growth Corporation (Canada), Aurora Cannabis Inc. (Canada), Tikun Olam (Israel), Cannabis Science Inc. (US), Aphria Inc. (Canada), Maricann Group Inc. (Canada), Tilray Inc. (Canada), VIVO Cannabis Inc. (Canada), Medical Marijuana, Inc. (US), STENOCARE (Denmark), Cronos Group Inc. (Canada), Terra Tech Corp. (US), and MedMen (US). MedMen is focusing on increasing its production capacity, with the use of advanced technology that is comparable to the standards used in the biotech & pharmaceutical industries for the cultivation of cannabis plants. The company wants to increase its reach by partnership and acquisitions with various dispensaries in the US. Terra Tech Corp., through its seed to sale model, keeps manufacturing low-cost cannabis to help increase profitability to capture the California, Nevada, and New Jersey markets. For instance, to capture the cannabis market in Nevada, it has secured four dispensaries, two cultivation centers, and two production & extraction facilities in the region. In October 2018, Spectrum Cannabis (Canada), a wholly owned subsidiary of Canopy Growth Corporation, partnered with Ontario Long Term Care Association (OLTCA) (Canada) for the pilot study on cannabis as an alternative source of medicine for degenerative cognitive function. In October 2018, MedMen launched new products under the brand name ”Statemade”. The products would be distributed in Arizona, California, Florida, and New York, in the US. In October 2018, MedMen invested in Old Pal (US), a supplier of high-quality cannabis flowers. Through this investment, the company aimed to increase its customer base. In September 2018, Aphria Inc. acquired LATAM Holdings (Canada). This acquisition would give the company access to countries in South America and the Caribbean such as Colombia, Argentina, Jamaica, and Brazil. Who are the major market players in the cannabis market? What are the regional growth trends and the largest revenue-generating regions for cannabis? Which are the major regions that are expected to witness significant growth in the medical cannabis market? What are the major types of cannabis that are expected to gain maximum market revenue and share during the forecast period? Which is the major application that will be accounting for the majority of the revenue during the forecast period?